A little something different an Irish Cream Coffee So Good Cocktail. Coffee isn’t anything new around here but I don’t usually post cocktails on the blog. I think I have a couple times but usually just share them on my Instagram. I decided to share this one today for a couple reasons but the main reason is tradition. Another well I’m doing a Coffee So Good Giveaway over on my Instagram. Which is delicious on it’s own but I’ve also been adding Peppermint Oil to the Mocha for a healthy dairy free (vegan) Peppermint Mocha! I’m all about tradition, especially holiday traditions, and even more so this year. You already know that I love my single serve coffee machine (more on this at Little Coffee Place), and regularly put Irish cream into my coffee. Irish Cream Coffees have been a tradition of my dear grandmother (the one I am very close with that I use to take shopping before we went to the nursing home and still go have coffee dates with weekly and paint her nails, which I have shared our coffee and froyo dates over the last 5 years from time to time on social media and also posted about in Friday’s post) for as long as I can remember and probably even her mother as they always talked about their Irish heritage. When we bought our house over 14 years ago something else came with it, we got to host Christmas. Yes even though Christmas was only a couple months away when we bought it I was ready, or so I thought. My parents always hosted Christmas and Christmas has always been a big deal. With my grandma and grandpa on my mom’s side always having a big event, the largest tree I ever saw, getting dressed up every year, a big fancy dinner, going to church, and lots of presents. I remember my parents hosting it at our house for my dad’s for years and Santa even coming a couple of years. We started hosting Christmas and it was just enough people to have a couple of tables and still do fancy sit down dinners. Now the group has grown and I try to keep it a little simpler as we have people sitting all over the house. As the tradition was past down to us so was a new one. My parents moved up north, which is why we were pasted the tradition of hosting, and started also staying with us for the Christmas holiday. We wake up have coffee and my mother or husband make caramel or cinnamon rolls, we open presents, and than would go to my grandmothers for breakfast before later going to my in-laws. Grandma’s house we had our Bailey’s and coffee. As my grandmother’s health went down she came over to our house for breakfast and I made sure I always had my Baileys for coffee. I did also have another coffee drink I started making with brandy and mulling spice infused whipped cream but there was always Baileys and mimosas for Christmas. With grandma now in a nursing home I can’t stand the thought of her spending Christmas there. The year before last I was able to get her out of there and she was able to stay with us. She slept in the chair in the living room by the Christmas tree, my dad and husband had to help her move around, but still she was here so I would have rearranged the house had I had to. I even bought her, my mother, and myself matching pajamas from Victoria Secret. Last year she wasn’t able to stay with us and this year she won’t either but she will still spend Christmas morning with us. I also have many of her Christmas things that have been past down to me which will be out this year so I’m trying to use those as my Christmas inspiration. When grandma comes Christmas morning we will have our Baileys and coffee. I’ve tried to find the Almond Milk Baileys but no luck so I made homemade Baileys. Not that it was a fail but there was a lot of espresso in it to which my dad questioned me adding espresso to it. So I was looking for dairy free options so my tummy wouldn’t hate me. 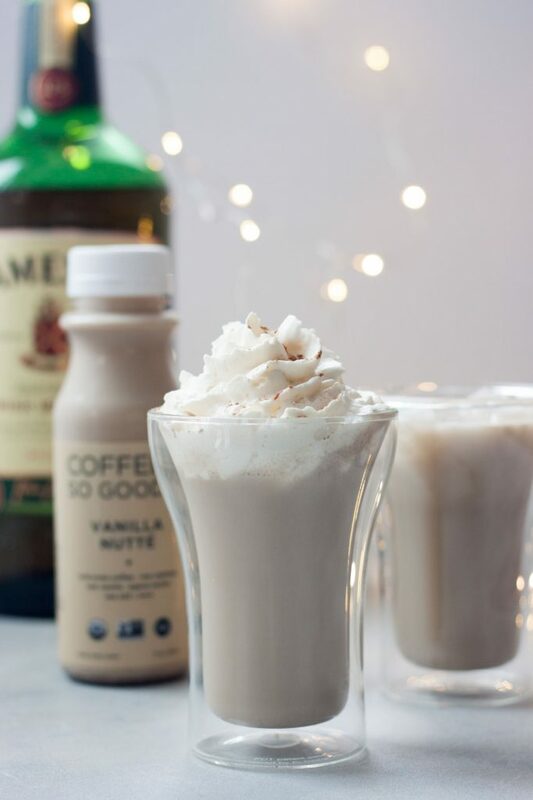 I have this quick and easy solution… just add Irish Whiskey to my Vanilla Nutte Coffee So Good, oh and for fun a little coconut whipped cream! 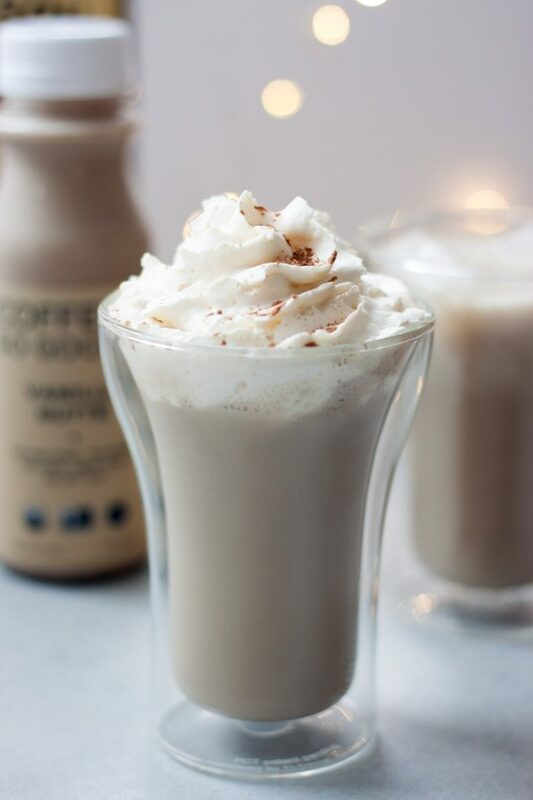 I haven’t given up on making my own Irish Cream but this quick and easy cocktail is great for making an easy dairy free (vegan) drink at a party. Just bring a bottle of Vanilla Nutte Coffee So Good. Maybe you aren’t dairy free/vegan but have a family member who is coming for Christmas you can have a bottle on hand for them. Or maybe you travel for the holidays you can bring a small bottle or two with to have a Irish Cream Coffee So Good Cocktail my the fire at the hotel or snuggled up in the ski lodge without carrying around something big because these single serve bottles fit in your cooler, and make 2 cocktails each. * Available nationwide in Whole Foods and I also get it at stores like my local Lund’s & Byerly’s and co-ops. If you can’t find Coffee So Good in your area you can sub a dairy free vanilla coffee beverage try to find a thicker one. To serve over the rocks mix pour 4oz of Vanilla Nutte Coffee So Good and 2 shots of Irish Cream in a glass filled with ice. Alternatively mix together 4oz of coffee drink and 2 shots of Irish Cream in a glass, top with coconut whipped cream and a sprinkle of cacao powder. I bet that’s a fun holiday cocktail for the adults! Thank you Carmy! Cheers to happy healthy holidays! What a great holiday drink to serve for Christmas! Thanks for the recipe and the idea! Thank you! Tis the time of year. oh wow great for holiday brunches! I need to try this! So awesome that it’s vegan! I hope you do! The coffees are great and I love that there are now more grab and go healthy vegan/dairy free options! What a blessing to have such a full house at Christmas! This sounds so yummy! Thank you! Yes I love all the family here but I do seem to put a lot of stress and having a crazy week leading up to it. Haha I love that you have Bailey’s and coffee as a Xmas tradition. Sounds delicious! I’ve never tried a drink with irish cream. Maybe I need to with your recipe. Yes or they now make a dairy free Bailey’s too! 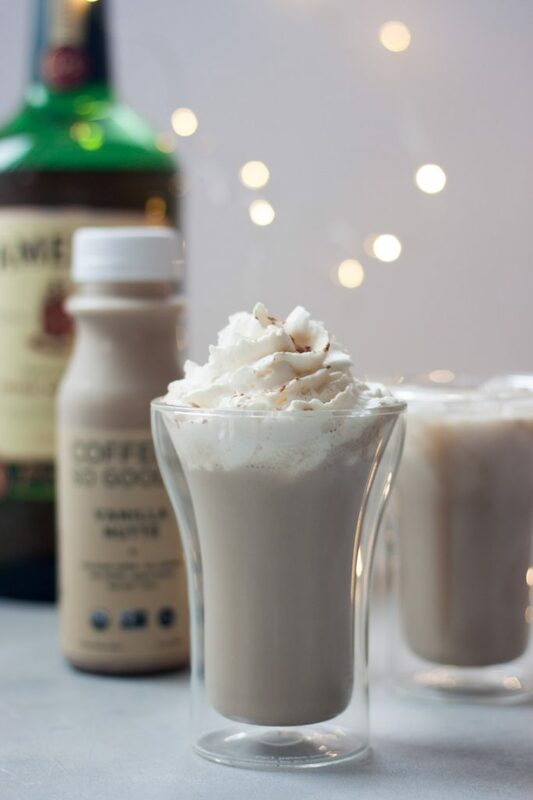 Irish Cream was always something my family has at Christmas and St. Patrick’s Day! What a fun cocktail idea! This sounds awesome 🙂 I haven’t had a coffee based cocktail in so long! Thank you! It’s so good and coffee is flowing even more during the busy holidays and we have a few coffee based holiday cocktails. Another one is coffee with brandy and mulling spice infused whipped cream. This recipe is perfect for holiday parties, love it! I love your family tradition and how it inspired such a great recipe! Thank you! Family and tradition are so important to me and this year I’m feeling the need to honor those traditions even more. bailey makes everything SO GOOD. These look amazing!! Such a fun idea and perfect for the holidays!! I’m usually not a big coffee flavor fan. 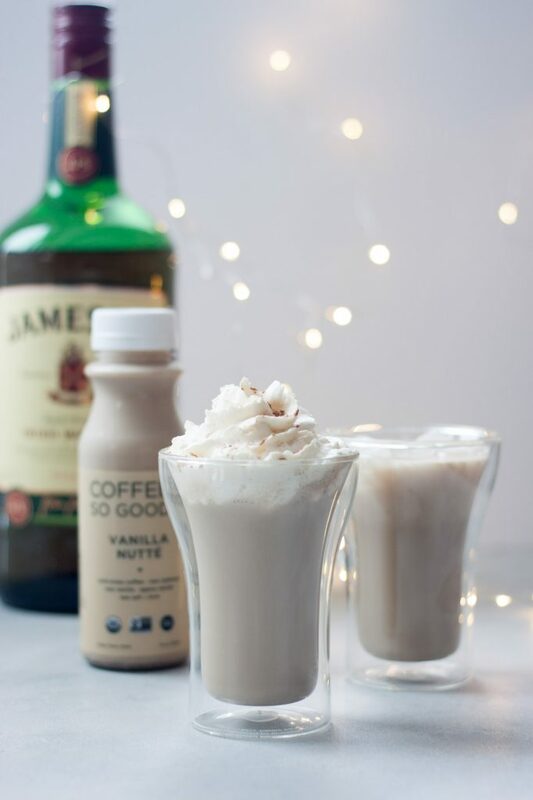 Unless it’s Irish Cream fun drinks like this around the holidays! Looks sooo good. Oh I wonder if you could put it in hot cocoa, I never thought about a non coffee way to enjoy Bailey’s. Other than Bailey’s on the rocks. Oh trust me it does! Let me know what you think though. Oh wow. I just checked their website and those creamy coffee drinks look amazing! I really need to share on those. I would probably drink this too fast, lol! It looks so tasty. Oh I love that you have the same tradition. My husband found the Almond Milk Bailey’s while he was in California (they don’t sell it here)! Only problem is he brought back one bottle. I need to go check the ingredients… but yes this is a great solution! Perfect! This recipe looks dangerously delicious and would be fun to share with others! YES! My husband finally found the Bailey’s Almond Milk in California and brought me back a bottle! This is a great dairy free option though that honestly might taste a little better as it isn’t as sweet and has good organic ingredients. That looks so good! I almost wish I had a cup right now…5:00 somewhere right? Thank you! Yes it’s always 5pm somewhere but since this is coffee it can be enjoyed in the morning too! 😉 Just probably not before work. Can I have one now??? This looks amazingly tasty and good! Love your photos too! Sure, come on over! Thank you! Yum! I love these! I need to make them over Christmas for our adult table!